Historically, the world's farmers produced food, feed and fiber. Today, they are starting to produce fuel as well. Since nearly everything we eat can be converted into automotive fuel, the high price of oil is becoming the support price for farm products. It is also determining the price of food. On any given day, there are now two groups of buyers in world commodity markets: one representing food processors and another representing biofuel producers. The line between the food and fuel economies has suddenly blurred as service stations compete with supermarkets for the same commodities. First triggered by the oil shocks of the 1970s, production of biofuels — principally ethanol from sugarcane in Brazil and corn in the United States — grew rapidly for some years, but then stagnated during the 1990s. After 2000, as oil prices edged upward, it began to gain momentum again. Europe, meanwhile, led by Germany and France, was starting to extract biodiesel from oilseeds. Production of biofuels in 2005 equaled nearly 2% of world gasoline use. From 2000 to 2005, ethanol production worldwide increased from 4.6 billion to 12.2 billion gallons, a jump of 165%. Biodiesel, starting from a small base of 251 million gallons in 2000, climbed to an estimated 790 million gallons in 2005, more than tripling. Governments support biofuel production because of concerns about climate change and a possible shrinkage in the flow of imported oil. Since substituting biofuels for gasoline reduces carbon emissions, governments see this as a way to meet their carbon reduction goals. Biofuels also have a domestic economic appeal, in part because locally produced fuel creates jobs and keeps money within the country. Brazil, using sugarcane as the feedstock for ethanol, is producing some 4 billion gallons a year, satisfying 40% of its automotive fuel needs. The United States, using corn as the feedstock, produced 3.4 billion gallons of ethanol in 2004, supplying just under 2% of the fuel used by its vast automotive fleet. Forecasts for 2005 show U.S. ethanol output overtaking that of Brazil, at least temporarily. Europe ranks third in fuel ethanol output, the lion's share from France, the United Kingdom and Spain. Europe's distillers use mostly sugar beets, wheat and barley. Interest in biofuels has escalated sharply since oil prices reached $40 per barrel in mid-2004. Brazil, the world's largest sugarcane producer, is emerging as the world leader in farm fuel production. In 2004, half of its sugarcane crop was used for sugar and half for ethanol. Expanding the sugarcane area from 5.3 million hectares in 2005 to some 8 million hectares would enable it to become self-sufficient in automotive fuel within a matter of years, while maintaining its sugar production and exports. Even though Brazil has phased out ethanol subsidies, by mid-2005 the private sector had committed $5.1 billion to investment in sugar mills and distilleries over the next five years. Thinking beyond its currently modest exports of ethanol, Brazil is discussing ethanol supply contracts with Japan and China. Producing ethanol at 60 cents per gallon, Brazil is in a strong competitive position in a world with $60-a-barrel oil. U.S. ethanol production, almost entirely from corn, benefits from a government subsidy of 51 cents per gallon. Ethanol produced from $3-a-bushel corn in the United States costs roughly $1.40 per gallon, more than twice the cost of Brazil's cane-based ethanol. Although it took roughly a decade to develop the first billion gallons of U.S. distilling capacity and another decade for the second billion, the third billion was added in two years. The fourth billion will likely be added in even less time. In addition to corporations, U.S. farm groups are also investing heavily in ethanol distilleries. India, the world's second-largest producer of sugarcane, has 10 ethanol plants in operation and expects to have 20 additional plants up and running by the end of 2005. China is projected to bring on-line four plants producing up to 360 million gallons of additional fuel ethanol by the end of 2005, mostly from corn and wheat. Colombia and the Central American countries represent the other biofuel hot spot. Colombia is off to a fast start, opening one new ethanol distillery each month from August 2005 through the end of the year. The challenge is to coordinate growth in distillery construction with growth in sugarcane production. For biofuels used in diesel engines, Europe is the leader. Germany, producing 326 million gallons of biodiesel in 2004, is now covering 3% of its diesel fuel needs. Relying almost entirely on rapeseed (the principal source of cooking oil in Europe), it plans to expand output by half within the next few years. France, where biodiesel production totaled 150 million gallons in 2004, plans to double its output by 2007. Like Germany, it uses rapeseed as its feedstock. In both countries the impetus for biodiesel production comes from the European Union's goal of meeting 5.75% of automotive fuel needs with biofuels by 2010. Biofuels in Europe are exempted from the hefty taxes levied on gasoline and diesel. In the United States, a latecomer to biodiesel production, output is growing rapidly since the 2003 adoption of a $1-per- gallon subsidy that took effect in January 2005. Iowa, a leading soybean producer and a hotbed of soy-fuel enthusiasm, now has three biodiesel plants in operation, another under construction — and five more in the planning stages. State officials estimate that biodiesel plants will be extracting oil from 200 million bushels of the state's 500-million-bushel annual harvest within a few years, producing 280 million gallons of biodiesel. The four-fifths of the soybean left after the oil is extracted is a protein-rich livestock feed supplement, which is even more valuable than the oil itself. Other countries either producing biodiesel or planning to do so include Malaysia, Indonesia and Brazil. Malaysia and Indonesia, the major producers of palm oil, would likely use highly productive oil palm plantations as their feedstock source. Brazil, which has ambitious plans to ramp up biodiesel production, will also likely turn to palm oil. There are two key indicators in evaluating crops for biofuel production: the fuel yield per acre and the net energy yield of the biofuels, after subtracting the energy used in both production and refining. For ethanol, the top yields per acre are 714 gallons from sugar beets in France and 662 gallons per acre for sugarcane in Brazil. U.S. corn comes in at 354 gallons per acre, or roughly half the beet and cane yields. With biodiesel production, oil palm plantations are a strong first, with a yield of 508 gallons per acre. Next comes coconut oil, with 230 gallons per acre, and rapeseed, at 102 gallons per acre. Soybeans, grown primarily for their protein content, yield only 56 gallons per acre. For net energy yield, ethanol from sugarcane in Brazil is in a class all by itself, yielding over 8 units of energy for each unit invested in cane production and ethanol distillation. Once the sugary syrup is removed from the cane, the fibrous remainder, bagasse, is burned to provide the heat needed for distillation, eliminating the need for an additional external energy source. This helps explain why Brazil can produce cane-based ethanol for 60 cents per gallon. Ethanol from sugar beets in France comes in at 1.9 energy units for each unit of invested energy. Among the three principal feedstocks now used for ethanol production, U.S. corn-based ethanol, which relies largely on natural gas for distillation energy, comes in a distant third in net energy efficiency, yielding only 1.5 units of energy for each energy unit used. Another perhaps more promising option for producing ethanol is to use enzymes to break down cellulosic materials, such as switchgrass, a vigorously growing perennial grass, or fast-growing trees, such as hybrid poplars. Ethanol is now being produced from cellulose in a small demonstration plant in Canada. If switchgrass turns out to be an economic source of ethanol, as some analysts think it may, it will be a major breakthrough, since it can be grown on land that is highly erodible or otherwise not suitable for annual crops. In a competitive world market for crop-based ethanol, the future belongs to sugarcane and switchgrass. The ethanol yield per acre for switchgrass is calculated at 1,150 gallons, higher even than for sugarcane. The net energy yield, however, is roughly 4, far above the 1.5 for corn — but less than the 8 for sugarcane. Aside from the prospective use of cellulose, current and planned ethanol-producing operations use food crops such as sugarcane, sugar beets, corn, wheat and barley. The United States, for example, in 2004 used 32 million tons of corn to produce 3.4 billion gallons of ethanol. Although this is scarcely 12% of the huge U.S. corn crop, it is enough to feed 100 million people at average world grain consumption levels. In an oil-short world, what will be the economic and environmental effects of agriculture's emergence as a producer of transport fuels? Agriculture's role in the global economy clearly will be strengthened as it faces a vast, virtually unlimited market for automotive fuel. Tropical and subtropical countries that can produce sugarcane or palm oil will be able to fully exploit their year-round growing conditions, giving them a strong comparative advantage in the world market. The risk is that economic pressures to clear land for expanding sugarcane production in the Brazilian cerrado and Amazon basin and for palm oil plantations in countries such as Indonesia and Malaysia will pose a major new threat to plant and animal diversity. In the absence of governmental constraints, the rising price of oil could quickly become the leading threat to biodiversity. With oil prices now high enough to stimulate potentially massive investments in fuel crop production, the world farm economy — already struggling to feed 6.5 billion people — will face far greater demands. How the world manages this new incredibly complex situation will tell us a great deal about the prospect for our energy-hungry 21st century civilization. 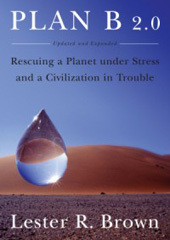 Adapted from “Plan B 2.0: Rescuing a Planet Under Stress and a Civilization in Trouble” by Lester R. Brown, published in 2006 by WW Norton and Company.